Newly awarded a 2012 Alfred P. Sloan Research Fellowship, Allan Sly, assistant professor of statistics, talks about his research into probability theory, his students and his own days as a UC Berkeley graduate student. Q: What is the primary focus of your research? A: I work in probability theory, a branch of mathematics and statistics dealing with randomness – in my case, random processes on networks. This can encompass a wide range of problems, including combinatorial problems like when you can efficiently count the number of independent sets of a graph, models of interacting particles from statistical physics, the ancestral trees of collections of species or interactions of economic agents. It turns out there are lots of connections mathematically between these problems. One recent problem I’ve been thinking about is when you can detect communities inside a social network. There’s some great mathematics there in work done by researchers in probability, statistics, computer science and physics. 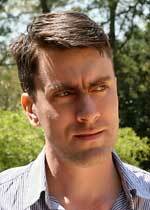 Allan Sly, assistant professor of statistics and a 2012 Sloan Research Fellow. Q: What are the potential benefits/applications to society that could arise from your research? A: My work tends to be basic research in probability theory, so often it’s the development of theory, sometimes directed at better understanding algorithms or statistical methods. Oftentimes, there’s a big gap between the methods used in practice and what can be proved in theory, so we’re always trying to understand at a mathematical level why algorithms work well in practice or the cases in which they don’t. Q: How do your students benefit from your research work? A: There’s a lot of exciting work being done in the statistics department here that I think makes it a great environment for students. I’ve been teaching the graduate probability course this semester, and we have some really sharp students. I try and illustrate the core theory with examples coming from research problems to show how the theory is used. Q: How has being at UC Berkeley helped advance your research? A: It’s a fantastically intellectually stimulating place, the students are excellent, and you’re always hearing great problems to think about from colleagues and about their new breakthroughs. Oh, and there are lots of great cafés around campus to think and read in, where you can’t help running into people from the department. Q: How did you get interested in doing this work? A: I came to Berkeley as a graduate student planning to work on completely different aspects of probability. But I took a range of great courses from professors here in statistics and computer science and had an extremely motivated advisor who kept introducing me to great new problems. It was fascinating to see the same probabilistic ideas come up in a wide range of different contexts. Q: What’s the most satisfying part of doing this research? A: It’s very satisfying when you prove a new result and really get to a new understanding of the mathematics behind the problem. In many of these problems, you can make an educated guess about the right answer. But to come up with a mathematical argument to prove it is often really hard, so it’s great to crack the problem.